How To Build A DIY Pergola - Create An Amazing Outdoor Living Area! How To Build A DIY Pergola – Create An Amazing Outdoor Living Area! When it comes to creating an outdoor living space that adds instant beauty, it’s hard to beat a DIY pergola! Mid to late summer is the perfect time to tackle an outdoor project. Especially one that can create an outdoor entertaining and dining space like a DIY pergola. And, by building now, it gives you plenty of time to enjoy it this fall, when cooler temperatures make for wonderful outdoor living. If there is one space we cherish more than any other at the farm, it is our homemade wooden pergola. It was the very first structure we created at the farm, and seven years later, it still stands strong today. Nestled between the garden, barn and fire pit, it has become a wonderful area to enjoy a meal – or simply relax and enjoy a little time with friends and family. A pergola is a great place to enjoy outdoor living! 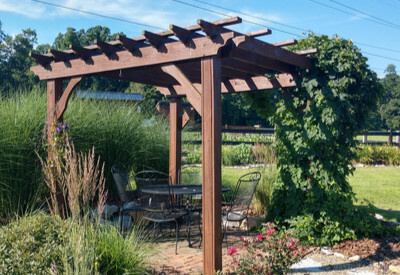 Although there are hundreds of instant “Plastic” Pergolas available on the market today, there is something special about the classic look and feel of a wooden pergola. It is strong and durable, and can be used to grow everything from wisteria, clematis, or even grapes or hops to provide natural overhead cover. 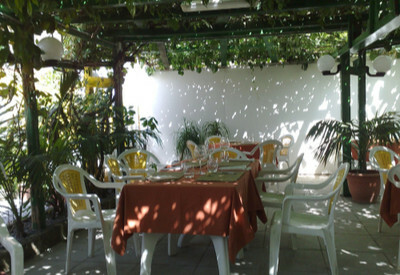 We grow hops on our garden pergola, and it provides a lush, thick and shady overhead roof to enjoy the outdoors. And, when it comes to those “plastic” versions, they are hard to get more than a year or two out of before they begin to fall apart or fade. Ever since building our first wooden pergola back at the farm, we have had a lot of fun building many more for friends and family. It is amazing that in a single day or two at most, and for just a few hundred dollars in materials, you can create such an incredible outdoor structure. We thought for today’s DIY article, we would share some of the tips and tricks we have learned from building over the years. For those interested, we do have the step by step plans in our Etsy store. Even after all of these years, it remains our most downloaded plan. Our very first pergola, still going strong at the farm. A strong and secure base is the single most important key to a long-lasting DIY pergola. Stay away from 4″ x 4″ posts. Although much less expensive than thicker posts, they simply don’t hold up over time. 4″ x 4″ posts will eventually bend and warp under the weight of the top. And for the few extra dollars per post, it is far better to purchase 4″ x 6″ or our personal favorite, 6 x 6″ beams for the base. When it comes to securing a pergola, you basically have two choices. You can bury posts, or secure them to a concrete pad or pier. We have used both, and quite honestly, both have worked incredibly well. If you will be burying, you need to place the posts deep enough so that they will be below the frost line. You can also easily attach them to a concrete pier or pad with post anchors. They really do an excellent job of securing posts. The other thing we always recommend in any outdoor wood project is exterior star screws. They hold wood forever and you never have to worry about them rusting. Whatever you do – be sure to secure your pergola! No matter how strong you think it might be, mother nature has a way of picking up and moving heavy objects when the wind blows strong! The key is using thick posts and 2X lumber for strength and durability. It really comes down to personal preference when it comes to what species of wood to choose. But one thing is for sure, build with nothing less that 2X lumber. We always create our top beams and purlin (the top cross pieces) boards from 2X lumber. Although there are thinner and less costly options – the 2″ thickness provides long-term strength and durability. As a note, remember that 2X lumber is actually 1.5 inches thick. 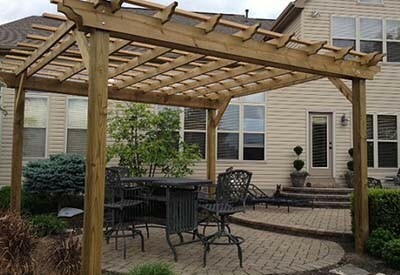 We have built almost all of our pergolas from treated lumber. It’s an economical and durable choice and stands up well to harsh outdoor conditions. It’s also versatile. It can be left to weather to a natural grey, and takes paint and stain well to match almost any wood species or decor. Cedar is also a great option, but the cost can be a bit painful. It can also be hard to find in the 2X thickness that is need to prevent warping and bending. We have had our treated pergola up for 7 years now, and it still looks brand new. The real key with any wood is to keep it protected with stain, paint or sealer. If you do that – it can last 20 years or more! One thing is for sure, we never get tired of sitting under our DIY Pergola and enjoying a little outdoor living time! Happy Pergola Building! Jim and Mary. To receive our 3 Home, Garden, Recipe and Simple Life articles each week, sign up below for our free email list. You can also follow us on Facebook, Twitter, Pinterest, or Instagram. This article may contain affiliate links. ← How To Make and Can Tomato Juice – What To Do And What NOT To Do!